Q&A: Are there any good lakes to go cliff jumping/diving at in Texas? Question by salty: Are there any good lakes to go cliff jumping/diving at in Texas? Hey guys, recently I went camping with my scout troop at Inks Lake near Austin, TX and we got the chance to go cliff diving at the Devil’s Waterhole there. It was loads of fun and I was thinking if there were other lakes or places around Texas that would be fun to go cliff diving or jumping at. Does any know of any good lakes/parks where my scout troop and I can go cliff jumping and also camping there? 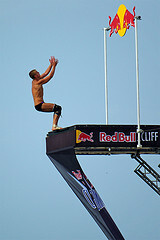 There’s usually cliff divers at Pace Bend Park on Lake Travis. There’s also a ledge at Krause Springs you can jump off, and a spot at Gus Fruh pool on the Barton Springs greenbelt (but there is no water right now).